Now just 5 DAYS AWAY! The Second Annual Taste of Terroir Wine Dinner is almost here, and we are so excited! Lovers of food and wine -- this one is just for you. 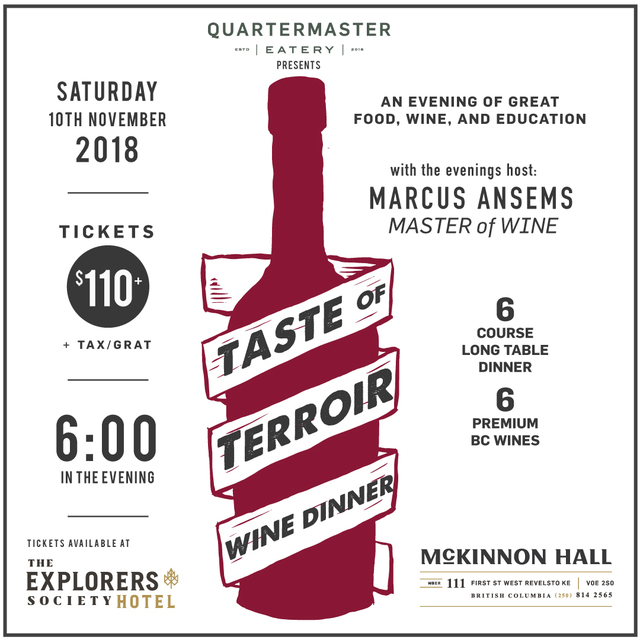 6 courses of delicious food, perfectly paired wine, and unique and interactive lessons from Marcus Ansems - one of 6 Masters of Wine in Canada, and a second generation winemaker. Marcus will talking about how soil, climate, wild fermentation, sustainable farming, and terrain affect the taste of the wine you drink, and what has made Daydreamer such a unique winery known for their small-batch, balanced, organic wines.